On 28 February 2018, Mami Mizutori will end her tenure as Executive Director. She will be replaced by Simon Kaner, Head of the Centre for Archaeology and Heritage on 1 March 2018. Mami will start a new job from March at the Geneva headquarters of the United Nations as the Assistant Secretary-General and Special Representative of Disaster Risk Reduction. She would like to take this opportunity to thank you all for the warm support and friendship she received during her time at Norwich. She hopes that the same support could be extended to Simon. We wish Mami every success in her new role. Simon looks forward to working closely with the entire staff of SISJAC in his new capacity and, with valued friends and partners, to furthering the mission of the Institute through researching, teaching and disseminating Japanese arts and cultures in all their richness and diversity. Simon will continue his role as the Director of the Centre for Japanese Studies (CJS) at UEA creating enhanced synergy between SISJAC and CJS. He also hopes to continue building lasting relationships with the Institute’s various partners, in particular the British Museum and SOAS. This change of leadership is happening at an exciting time for the Institute. We welcome two new academic staff this year: Dr Jennifer Coates, who joins the Institute in April; and Dr Eugenia Bogdanova-Kummer, who arrives in July. 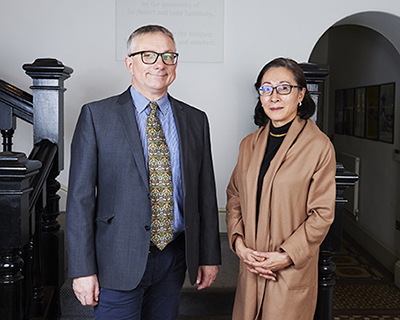 These new appointments represent a major investment in Japanese art history and cultural studies, and are of great importance as we take our mission forward under the leadership of Simon, together with Professor Nicole Coolidge Rousmaniere and Professor Toshio Watanabe. SISJAC is preparing for its relocation to the campus of the University of East Anglia in 2021, and we are working closely with the University to establish new research and teaching streams.